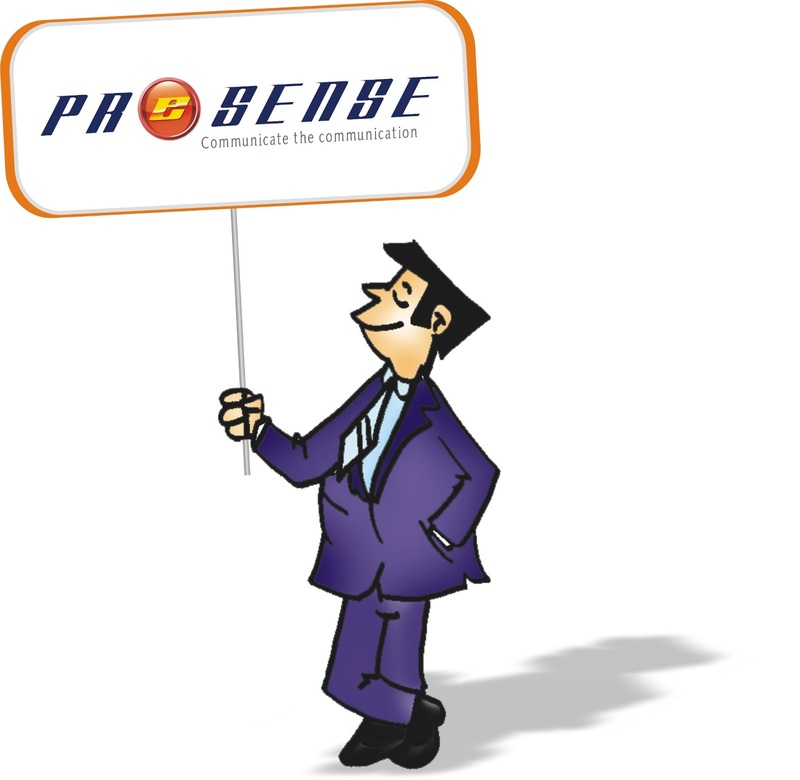 The cute little cartoon character, PRince has been adding value and humour to your ezine, PreSense for the past five years. He has been conveying powerful messages with a sense of humour. The creation and the journey of PRince is interesting and amazing. 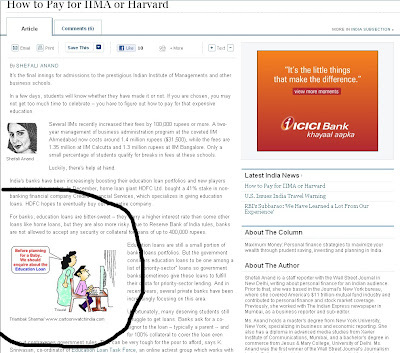 In July 2008, on Dr Abdul Kalam’s suggestion, the editorial team decided to introduce cartoons in the ezine. When we made an announcement to the effect in the PrPoint group, Mr Triambak Sharma, a well-known cartoonist from Raipur and the editor of Cartoonwatch volunteered to provide cartoons for the ezine every month. Instead of publishing regular assorted cartoons, the editorial team decided on a cartoon character, on the lines of R K Laxman’s ‘Comman Man’, to convey the message. 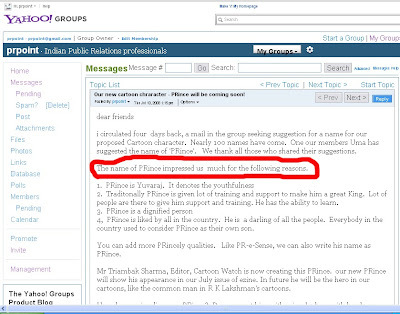 On 3rd July 2008, the editorial team made an announcement about its idea, in the groups, and invited suggestions from the members, and also a suitable name for the character. 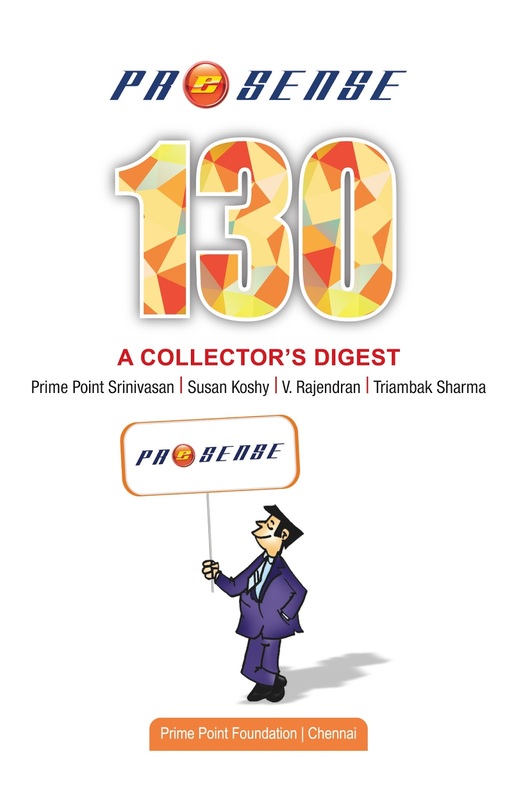 The team received an overwhelming response of 100 suggested names. 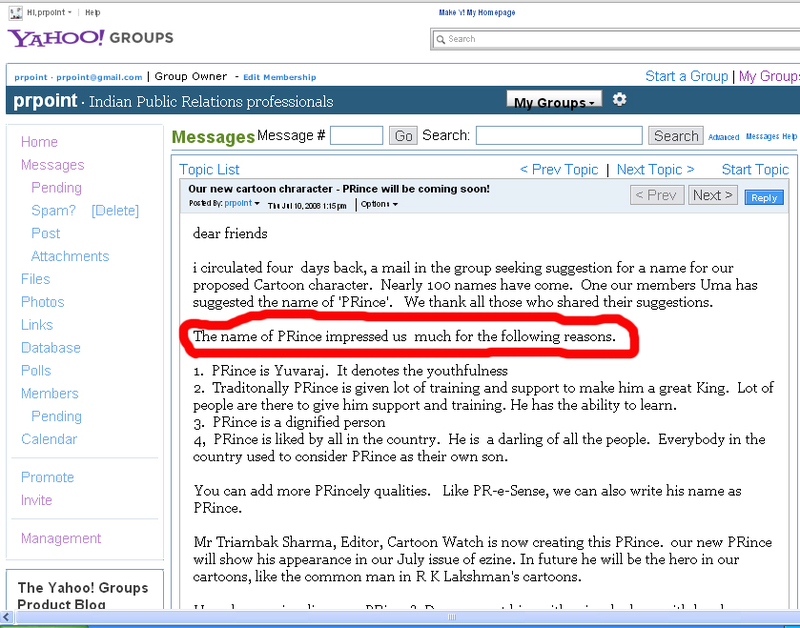 The suggestion given by Ms Uma, a communication professional to name the character ‘PRince’ received unanimous approval of the editorial team. ‘Prince’ was introduced to the groups on 10th July 2008. “I wanted PRince to be the youth icon of this 21st century, as a representative of the professionals working in corporate and other offices. Hence, I created him as an energetic young person a wearing trendy outfit with necktie. I am proud that PRince was born in Raipur”, says Triambak Sharma proudly. 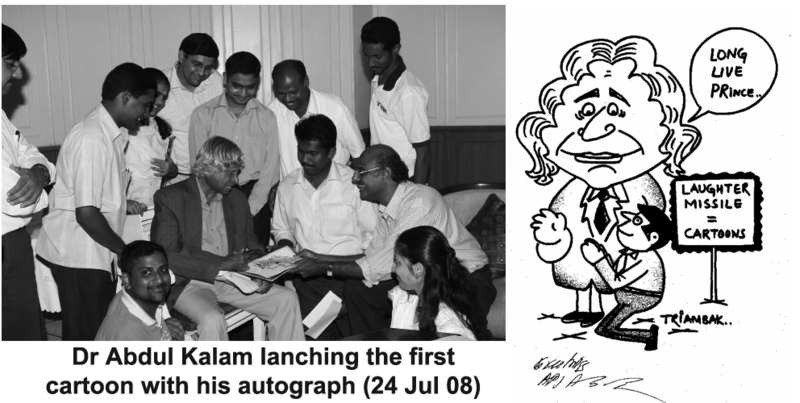 The first cartoon, created by Triambak Sharma, was launched by Dr Abdul Kalam himself with his autograph, on 24th July 2008 at Rajbhavan, Chennai. The cartoon character was created and launched within 20 days of the editorial team’s decision to include the cartoon in the ezine. Every edition of the ezine from July 2008 onwards contains the PRince cartoon. In every issue, PRince conveyed a powerful message with a sense of humour. Thus, PRince won itself many fans. PRince became popular worldwide. 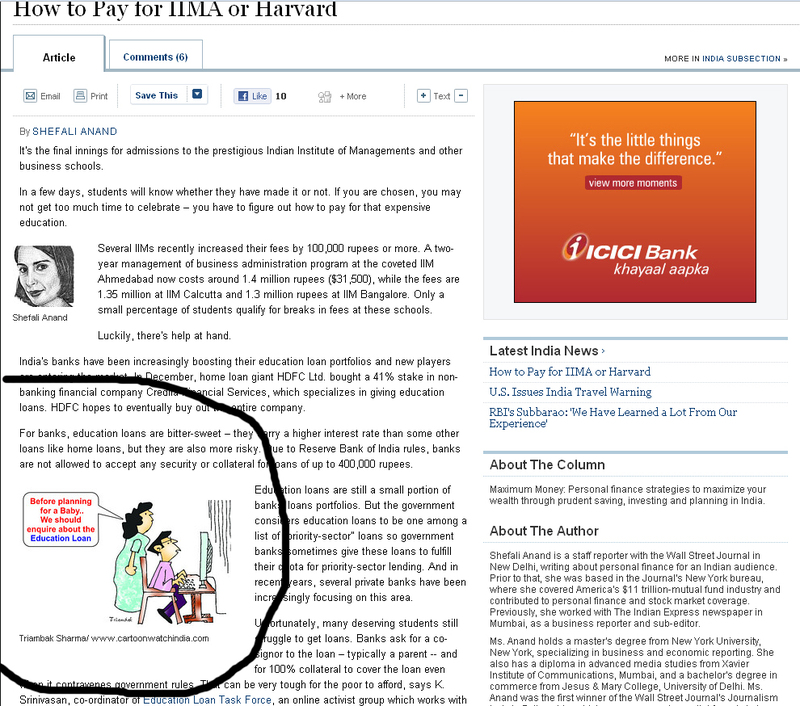 In April 2010, The Wall Street Journal of America, carried one of the PRince cartoons with the permission of Triambak Sharma. The popularity of PRince grew day by day, both nationally and internationally. 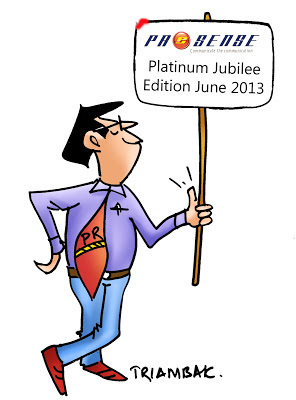 In May 2010, a CD containing the PRince cartoons was released on the occasion of the launch of the Golden Jubilee edition (50th) of ezine. it was also displayed on the internet. PRince who was a Casanova till then, married his sweetheart ‘PRincess’ in the Diamond Jubilee 60th edition, published in February 2011 (picture on the right). “Only married people can understand the problems of the common person and communicate in a mature manner. Subsequent to his marriage, PRince started talking about many serious issues affecting the common citizen”, says Triambak Sharma when asked why PRince married hastily. The readers could notice that after the 61st edition, PRince conveyed more serious messages than what he used to, before his marriage. 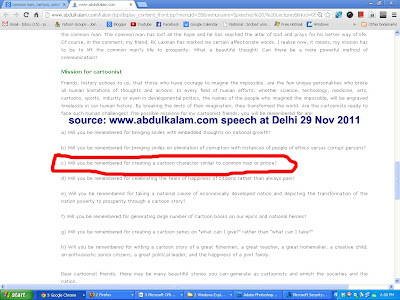 Interestingly, Dr A P J Abdul Kalam himself is one of the great fans of PRince. 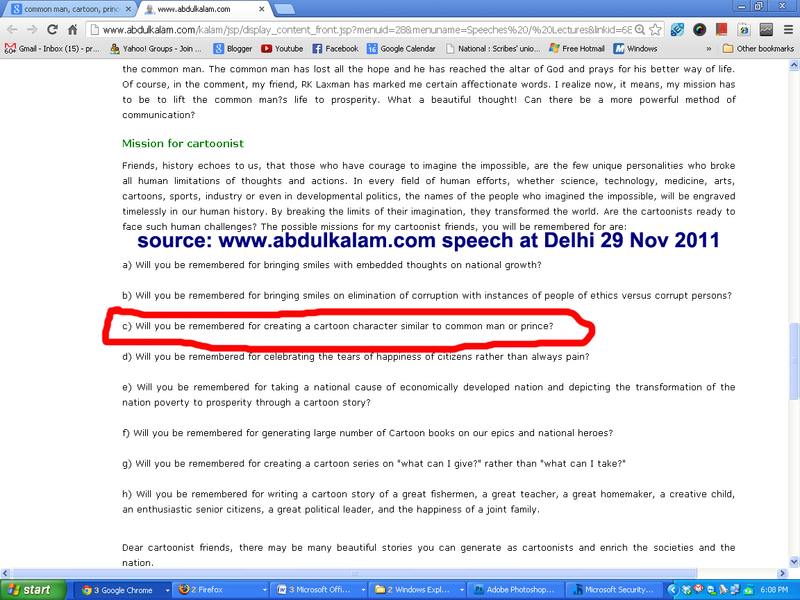 While addressing the Cartoon Festival at New Delhi on 29th April 2011, Dr Abdul Kalam suggested that cartoonists should be remembered for creating cartoon characters like ‘Common Man’ and ‘PRince’. In the Cartoon Festival organised at Raipur (Chhattisgarh) on 29th June 2013, Dr Raman Singh, the Chief Minister of Chhattisgarh was the Chief Guest. A video poresentation on the cartoon character PRince was shown to the Hon’ble Chief Minister and to the audience. A CD containing the past 55 cartoons published in the ezine from July 2008 to June 2013 was also handed over to Dr Raman Singh, the Chief Minister by Triambak Sharma. The Chief Minister highly appreciated the concept of cartoon character and enjoyed the PRince cartoons. The past 75 editions of ezine PreSense and the ebook on PRince cartoons can be downloaded from the link. Please watch a brief video presentation on the PRince cartoon. While Mumbai can be proud of ‘Common Man’ created by R K Laxman, Raipur can now be proud of Triambak’s ‘PRince’. We are pleased to release the Platinum Jubilee (75th) edition of ezine PreSense. This edition was launched by youngsters /students on 23rd June 2013 simultaneously at Chennai, Coimbatore and Motihari (Bihar) in the presence of youngsters. This edition is dedicated to Indian youth. 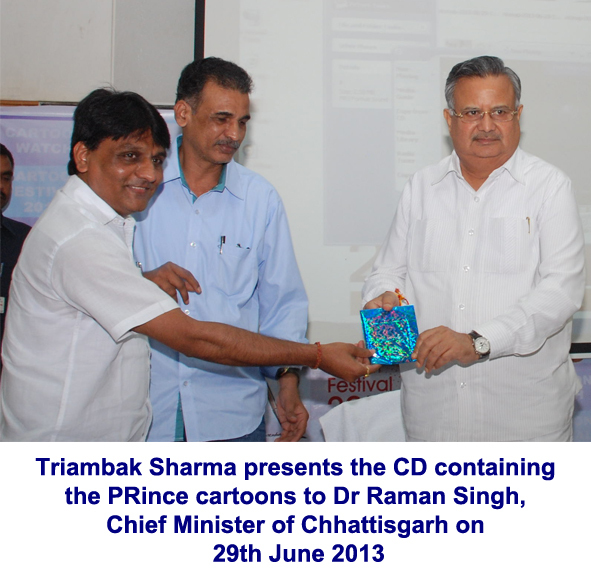 On 29th June 2013, our cartoon editor Triambak Sharma handed over the CD containing the past PRince cartoons to Dr Raman Singh, Chief Minister of Chhattisgarh during the Cartoon Festival.. The Chief Minister watched a short video presentation on the cartoon character PRince and appreciated the efforts.